The Sig Sauer P250's modular design offers the potential of many pistols out of one. When I heard that Sig Sauer was coming out with a new polymer pistol, I responded with a shrug. Let's face it; today's market is flooded with polymer-framed handguns, and you probably had the same reaction when you heard about the new P250. So let me start off by telling you that the P250 is not just another polymer pistol. 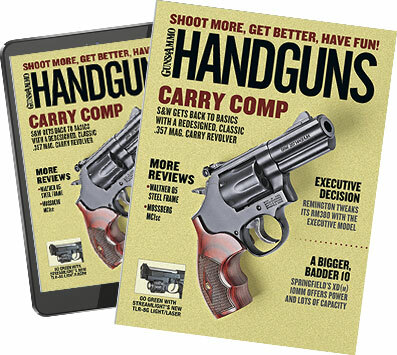 In fact, it is an entirely new concept in handguns, one I believe will be appreciated by shooters everywhere. The P250 is constructed with a polymer grip module and metal frame/fire control assembly that can be removed from the pistol. The frame/fire control assembly itself is in fact the "pistol"--as BATF would define it--because it bears the serial number. What Sig Sauer has done is create a system whereby the shooter can change caliber and pistol size at will in order to adapt a handgun to specific conditions and tasks. It works like this. Let's say you purchase a full-size P250 in .40 S&W in your choice of small, medium or large grip circumferences and a standard or short trigger. Then, down the road a ways, you decide you want a smaller pistol. Normally this would mean you would have to purchase an entirely new pistol, but not if you own a P250. All you have to do is order a compact or subcompact grip module and a slide assembly. You then remove the frame/fire control assembly from your full-size grip module and install it on the compact module with the shorter slide and barrel. Presto, you now have two handguns but, legally, only the original "pistol." And if you decide you want a compact pistol with a full-size slide and barrel (or vice versa)? No problemo, just swap the top ends. If you want to go bigger, order a .45 ACP grip module, slide assembly and magazines. You drop your frame/fire control assembly into this, and you're ready to rock 'n roll. SIG offers the P250 pistol with two different-size grip modules: one for the 9mm, .357 SIG and .40 cartridges, and another for the .45 ACP. Both are available in three versions--full, compact and subcompact--with three different grip circumferences (two on the subcompact). As the only real difference between the grip modules is the length of the grip itself, each will accept the full, compact and subcompact slide assemblies. Within a given size family, there are six different variations, allowing you to fit the gun to an individual hand based on two different trigger lengths and three different grip modules, each with unique grip circumferences. In theory, this gives the shooter the choice of an almost unlimited number of configurations. This commonality of parts means the SIG P250 uses 30 to 40 percent fewer parts than a traditional semiautomatic pistol, streamlining maintenance and spare-parts costs. The modular frame/fire control assembly contains the trigger mechanism, hammer, ambidextrous slide catch levers, takedown lever and a steel shaft on which the barrel articulates to unlock from the slide. The slide does not bear upon the grip module at all, but during recoil it rides on four steel rails that are integral with the frame/fire control assembly. Changing the module and frame/ fire control assembly from one grip module to the other is simplicity itself. You first disassemble pistol as per the instructions in the owner's manual and then rotate and pull the takedown lever out of the frame. Pulling up on the front frame rails while drawing the hammer back rotates the frame assembly out of the grip module. To install the frame assembly into another grip module, you insert the frame locking tab at the rear of the assembly into the matching slot inside the rear of the grip module, pull back on the hammer to move the trigger rearward slightly and push the assembly down into the grip module. Reinstall the takedown lever and slide assembly and you've got a "new" pistol. P250 pistols are fitted with a double-action-only trigger with a pull of approximately six pounds. This not only allows for the same, consistent trigger pull for each shot but provides the traditional simplicity and safety features of the double-action revolver. I am a big fan of this type of trigger mechanism as I believe simplicity of operation is of the utmost importance on any handgun intended for police service or defensive purposes. Unlike DAO triggers on some pistols, the P250 allows multiple strikes upon a recalcitrant primer in the event of a misfire. The Siglite sights are another attractive feature. While the sight employs the three-dot system common to most night sights, in daylight I found the two rear dots to be subdued while the front was quite prominent. That made sight alignment and target acquisition in bright light very fast. All you southpaws out there will be happy to know that the P250 was designed with you in mind. The pistol comes standard with ambidextrous slide catch levers, and the magazine release button can be switched from port to starboard very easily. The P250 functions in conventional fashion. The slide and barrel are locked together by means of the barrel hood moving up into and bearing against the front edge of the ejection port. Upon firing, slide assembly moves to the rear whereupon an angled cam on the bottom of the barrel moves on a steel shaft in the frame, pulling the barrel down and allowing the slide to continue to the rear, extracting and ejecting the spent cartridge case. The recoil spring, located under the barrel, then pulls the slide forward, stripping the next cartridge out of the magazine and chambering it. As the slide/barrel assembly go into battery, the barrel is cammed upwards, locking the two parts together again. The test sample provided by Sig Sauer was a typical example of the myriad combinations possible with this system. It had a compact grip module topped with a subcompact slide and chambered for the 9mm Parabellum (my favorite cartridge). I had requested a medium-width grip which, thanks to the small finger rest extension on the magazine base plate, provided an ergonomically pleasing purchase on a pistol. As has become standard on most semiautomatic pistols today, all P250 grip modules feature an accessory rail for mounting lights, laser sights and other types of tactical accessories. I arrived at Trigger Time Valley with the P250 Compact, my friend Rusty Rawsen, a sufficient supply of 9mm ammunition and the assorted impedimenta of the trade. Our first chore was to run the P250 through the mandatory accuracy testing, firing the pistol from an MTM Predator rest at 50 feet. All of our groups were beautifully centered, and there were very few bullet impacts outside of the targets' respective 10-rings. This was one of the more accurate out-of-the-box pistols either of us had fired in some time. Before moving on to more enlightening (and entertaining) forms of shooting, we ran five rounds of each of our test loads across my Chrony chronograph to see what type of velocities we were getting from the subcompact's short barrel. I had recently obtained a supply of Birchwood-Casey's B-24 Dirty Bird targets, and I set up a pair of them to run the following drills. â€¢ Five yards. Draw pistol and engage each target with four rounds. Perform a combat reload and repeat, firing the pistol unsupported (one-handed). â€¢ Ten yards. Draw pistol and double-tap each target, perform a combat reload and engage them again. Reholster the pistol and repeat the drill three more times. â€¢ Fifteen yards. Draw pistol and engage each target with four rounds, slow aimed fire. Reload and repeat twice. I found the P250's handling to be excellent, although rapid-fire shots tended to wander a bit to the right, but nothing went outside the 8 ring. Not too bad for the first time out. It is my practice to point out any negative features on a test gun. In this case there were none. In fact, the only thing I would like to see is for Sig Sauer to offer the option of a fiber-optic front sight. As my eyes have become more, ahem, "experienced," I find that I shoot significantly better with such sights. Other than that, I think Sig Sauer has yet another winner in its product line, and it is going to be amusing to watch the competition play catch up.